​Ever since I was a child I have enjoyed being creative and making useful things. Making items out of clay has always fascinated me. It is a wonderful process of forming something from a moist, soft substance and then firing it into a strong piece that will last many lifetimes. Originally, I found my inspiration in classic Greek and Asian pottery. Japanese traditions incorporate art into everyday living. I have always loved the idea of eating and drinking from beautiful pottery every day, not just on special occasions. Handmade dish ware brings a sense of ritualistic importance to the meals I share with the people I love. Today I find most of my inspiration hiking in the Big Horn Mountains or walking along Clear Creek in and near Buffalo, Wyoming. I find beauty in nature. Colors in a rock may inspire me to create a certain glaze or a leaf from a plant may be incorporated into the surface design. I like to use the style and traditional shapes of Greek antiquities, Chinese, and Japanese pottery. It is also fun to incorporate whimsical twists to create my own style of work. As a clay artist, I enjoy the challenges of constructing beautiful forms out of clay, the chemistry that is used to make glazes, and the tremendous reward and satisfaction that comes from others enjoying my work. I choose to work in clay because it is a medium that continues to keep me interested and inspired. 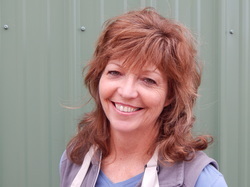 Bonnie has been making functional pottery for over 46 years. By the time she graduated from high school she was working in a cooperative potter studio, creating her own work, making glazes, clay bodies, loading the kiln and firing her work. She attended community college to study art with an emphasis on ceramic art. Later she attended Mount Saint Mary's College Occupational Therapy program and became a certified occupational therapist assistant ( C.O.T.A.). During her career as an O.T., she created a fully equipped studio and worked as a studio potter part time. She became a member of the American Ceramic Society Design Chapter and the Ventura Potters' Guild. Out of continued interest in learning she studied the history of Ceramic Art and glaze calculation at a local college. She has also attended several ceramic artist workshops. As a studio potter, she sold her work in juried shows and local galleries. In 2005, she moved to Buffalo, Wyoming and purchased the historic Buffalo Train Depot. She converted the 1920's train depot into an art gallery and pottery studio. The Potters' Depot, LLC opened April 2007. She maintains the gallery and sells locally-made pottery, including work of her own. She has her work in several galleries throughout Wyoming. She teaches classes out of her studio year round. She states "The high quality of my students' work is a reflection of me that I am proud of."